NDA Answer Key 2019 – Get here UPSC NDA 1 Answer Key for 21 Apr 2019 exam on same day as exam, after 12:30 PM for Mathematics and after 4:30 PM for GAT. Candidates can download NDA Answer Key Set A, B, C, D for National Defence Academy and Naval Academy (NDA & NA) written exam. Union Public Service Commission (UPSC) issues official answer key after final result of NDA. 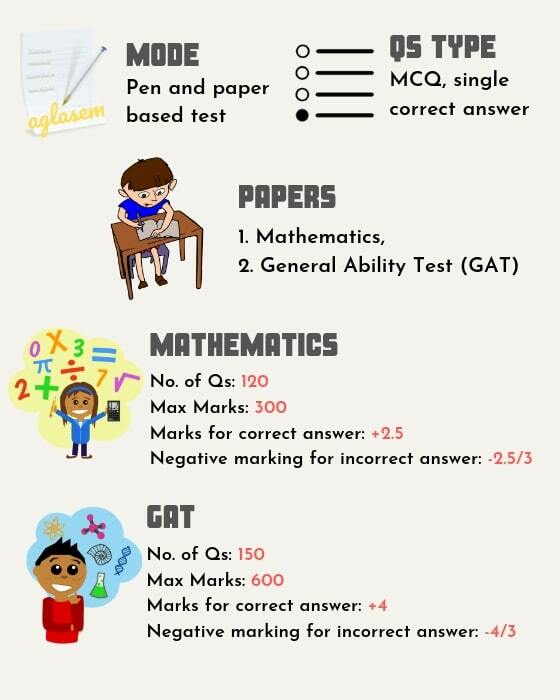 Marking scheme is +2.5, -2.5 for Mathematics, and +4, -4/3 for GAT. Those who clear cut off out of 900 are shortlisted for SSB. Get here all NDA Answer Key 2019. Latest: Mock test for NDA 2019 launched! 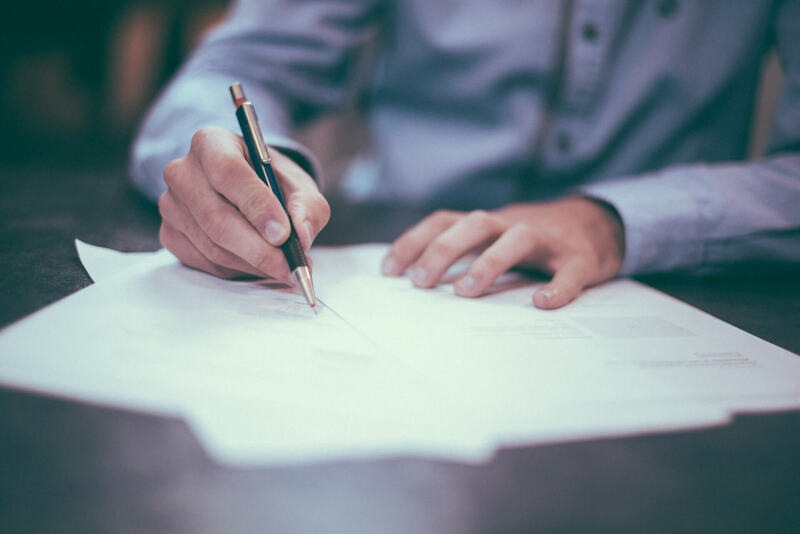 Take the free NDA 2019 mock test now! The answer key of NDA 2019 contains correct answers of 120 questions asked in Mathematics and 150 questions asked in GAT. It is beneficial for NDA aspirants as one can predict marks and chances of selection with NDA Answer Key 2019. Important dates related to it are in table below. To get answer key of your question paper set, click on the set wise links given below for NDA 2019 Mathematics and General Ability Test papers. Each NDA 1 Answer Key 2019 set has same questions, just the order of questions is different. Therefore download that answer key only of which you have question paper. We are happy to inform you that AglaSem will be going live on 21 April after the exam to bring to you exam analysis, answer keys, and expected cut offs. Our team will catch up with braveheart NDA aspirants at the exam centres. We will talk about the exam, differences with previous year papers, expected cut offs, and what next. Our team will go live on Youtube to solve GAT and Mathematics question papers. Watch out this space for the action, and do subscribe to our channel. Announcement! AglaSem Will Go Live On 21 April for NDA Answer Key, Expected Cut Off, Student Reactions! Here are some videos we have made for NDA aspirants in the past. How to prepare for NDA? Help Us Publish NDA 1 Answer Key 2019 Quickly! Bookmark this page! 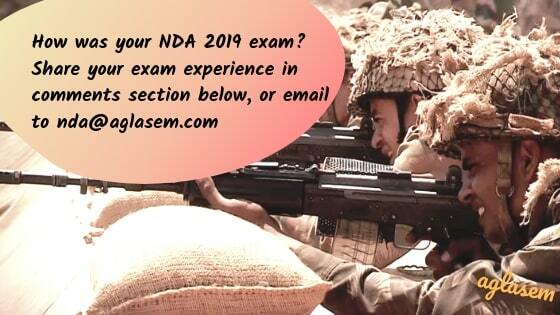 Come back after you have appeared in NDA 1 2019 exam to check answer keys. We are very proud of you that you appeared in the NDA exam. Knowing that you worked so hard, and that you dream so much about joining Indian Army, we are sure you will crack NDA. After your exam, we would like to help you and all the students who appeared in exam by providing you with the NDA 1 Answer Key 2019. However, to do that, we need the question paper. So, we request you to please send us the NDA 1 2019 Question Paper, after the exam, so that we can bring the answer key quickly. How to use NDA Answer Key? If your marks according to NDA Answer Key 2019 and following marking scheme are around the expected cut off marks, then you have high chances of selection. In accordance with the marking scheme, calculate marks. Please note that the answer keys you view / download here right after exam are by individual teachers and coaching centers. UPSC releases official NDA answer keys much later, after declaration of result. There may be difference between official and unofficial answer key of NDA 2019. However we try our best to provide closest answers. Nevertheless, exercise best judgement while taking any decision on basis of NDA 2019 Answer Key. You have to wait a while after exam for NDA 2019 Result of written exam. 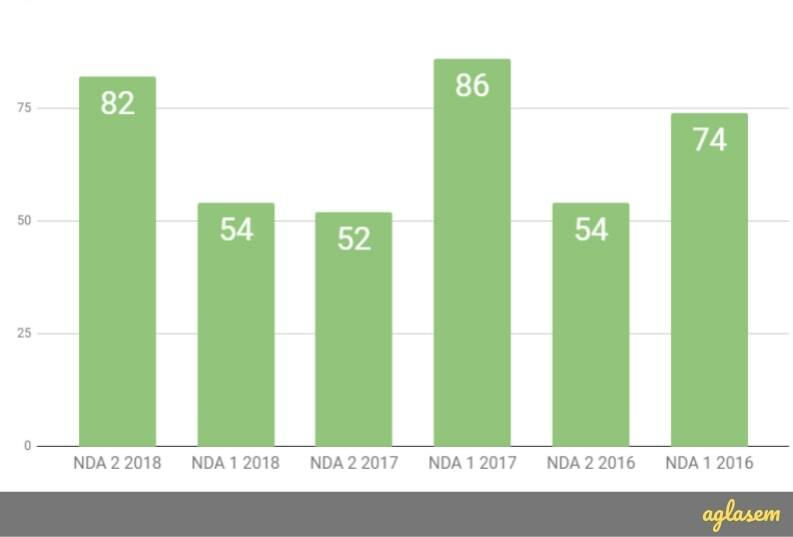 To give you an idea of how long the wait could be, here is a trend analysis graph of number of days between NDA exam and written exam result. NDA is a highly competitive exam. In order to clear it, you need to get ahead in it with good last minute preparation. There are 2 things to do in this regard. Practice previous year question papers of NDA. Check out most important questions and topic for the exam. We have curated a few good videos for you that cover the topics most asked in NDA exam. Watch them now! Every year, these three institutes namely Major Kalshi, Cavalier Institute, Baalnoi Academy publish UPSC NDA Answer Key after exam. Some take a few hours, others a few days. However students do look for their answer keys and solutions. After the exam, students can get their answer key also online from here. Will be available after exam. If you visit upsc.gov.in, then you will come across a page called Time Frame for Representation under the examinations system page. This contains a single PDF file titled Online Question Paper Representation Portal. As per it, UPSC gives a time frame of 7 days from the next day of exam in which candidates can make representations to Commission on questions asked in exam. Starting from next day of exam to 6 PM of 7th day is the period in which one can submit representations on questions. In the case of multi-days exams, the last day of exam is considered for determining the timeline. Example 1: UPSC Exam is on 1 March. Then, candidates can submit representations from 2 March to 8 March, 6 PM. Example 2: UPSC Exam is from 29 June to 1 July. Then, candidates can submit representations from 2 July to 8 July, 6 PM. The official site to submit challenges is https://upsconline.nic.in/miscellaneous/QPRep/. The Union Public Service Commission publishes NDA cut off after declaration of final result. A minimum qualifying marks is fixed in every subject though. Those who score more than that are considered, and then those who get overall marks equal to or more than cut off are declared as qualified in UPSC NDA Result of Written Exam. Note, this figure is on the basis of past few years analysis. It was 30% in NDA I 2015, 35% in NDA I 2014. To figure out NDA 1 2019 Cut Off, the Commission considers various factors such as number of applicants, basic expectation, vacancies, average performance, and so on. 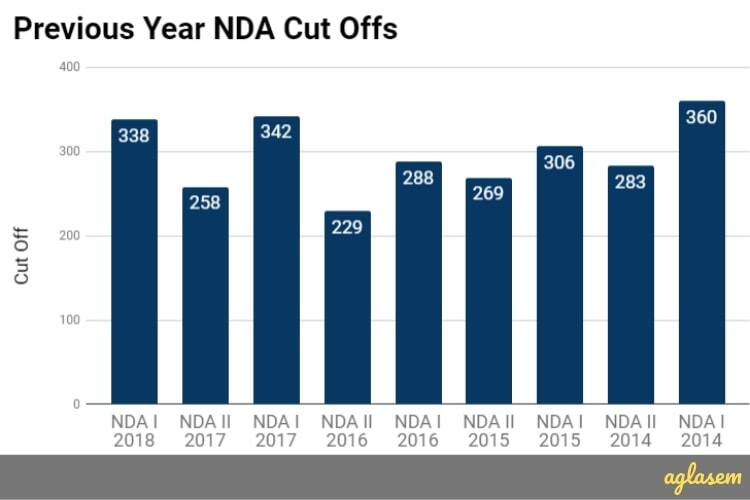 Nevertheless, we can take a look at previous year data to get an idea of what we can expect the next NDA cut off to be. This graph represents NDA cut off trends in past few years. NDA is one of the ways to join Indian Army. For 10+2 students, there is another option that is TES 10+2 scheme. Whereas NDA route requires one to go through written exam, then SSB, in TES scheme candidates are directly shortlisted on basis of application and then called for SSB process. 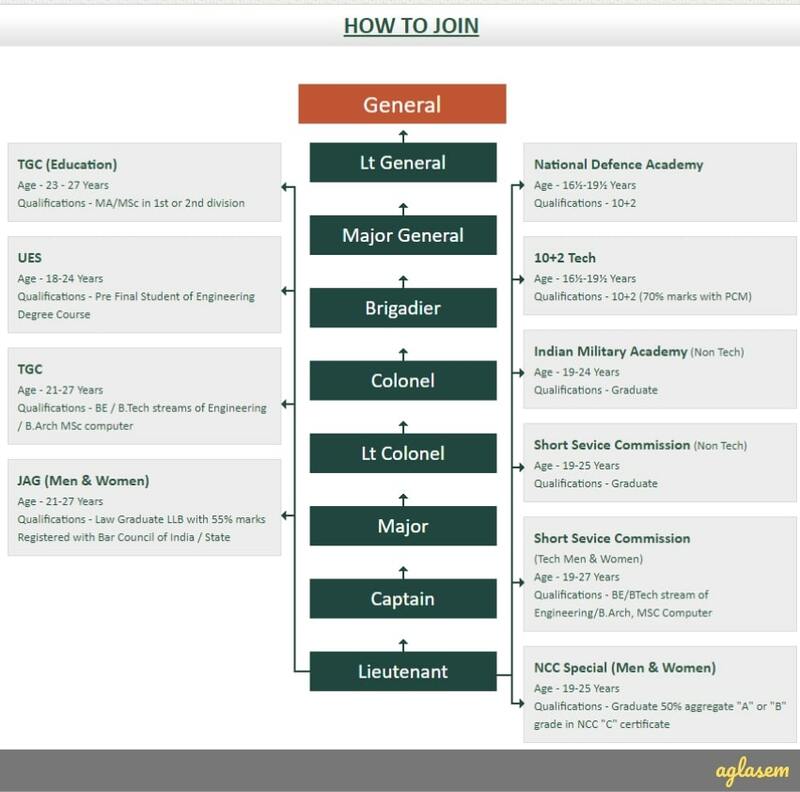 All the ways to join Indian Army are explained in the flowchart below. How To Get Official UPSC NDA 1 2019 Answer Key? 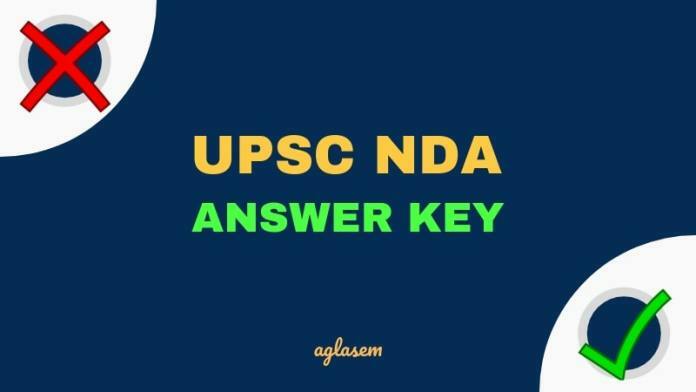 You can get official answer key of NDA 1 2019 from upsc.gov.in as per its availability. However it is significant to note here that the Union Public Service Commission releases official answer keys much later. The official answer keys are not published before result. Most other exam conducting bodies follow the process of conducting exam, then releasing answer key, and then issuing result. However in case of UPSC, this is not so. Nevertheless, if you are interested in getting the official answer key then you have to wait a little longer to get it from the website. For easy reference of aspirants, here are some past year answer keys of NDA exam that are officially released by UPSC. Navigate to Examinations >> Answer Keys. Go to Year 2019 table. Locate National Defence Academy and Naval Academy Examination (I), 2019. Click on link to download GAT Answer Key PDF, and Maths Answer Key PDF. The answer key of UPSC NDA & NA exam is useful in several ways. Some of the most prominent reasons that make it important are as follows. Lakhs of aspirants who appear for the exam can know the correct answers with NDA Answer Key right after exam. This alleviates their tension over how well they have performed. Also it helps one plan better on what to do next. When UPSC officially releases NDA Answer Key, it makes the recruitment / admission process more transparent. Candidates know exactly which answers UPSC considered correct and are assured they were marked right. Future NDA aspirants can prepare using NDA 2019 Question Paper and Answer Key. Q. After how many days of exam are official NDA Answer Keys released? Ans. For NDA I 2018, answer key was released 256 days after exam. In NDA II 2017, it was issued after 450 days. Then at time of NDA I 2017, answer key came after 339 days. So there is no fixed time for issuance of official answer key of NDA by UPSC. However it does come after final result, and sometimes after display of marks of recommended candidates. Q. Is there any difference between NDA answer keys of coaching institutes and official one? Ans. Such persons who are good at mathematics and GAT create those answer keys that coaching institutes and individuals publish. They try their best to provide correct answers. However there may be some difference between their answers and that by UPSC. Q. What if answers in official answer key are wrong? Ans. As can be seen, UPSC issues official answer keys much later after exam. Therefore there is no scope of representation against them. Nevertheless, one can submit challenges to questions right after exam through UPSC Online Question Paper Representation Portal. Thank you for visiting NDA 1 Answer Key 2019 by AglaSem. If you have any queries about NDA Answer Key, please ask in comments below. If you liked the resource, please share it with your friends. Thank you, and best of luck for NDA Result! UPES Dehradun Admission 2019 Apply Now! !